Approximately half of the 15 million personnel who served the British Empire during World War II came from Britain’s dominions, colonies and other territories, ranging from 2.5 million recruited in British India down to British Guiana’s 196. The British Indian Army and the armies of the self-governing dominions – Australia, Canada, South Africa, New Zealand – wanted to create their own versions of all the modern branches of the armed forces. Mechanization came slowly to the British Indian Army, as it did to many of the world’s armed forces in the late 1930s. British units had priority for tanks and motor vehicles, though some units fielded “India Pattern” light tanks by 1938. These machine-gun armed tanks were already obsolete by most standards, but British units were also still using similar models and would take them into battle in 1939 and 1940. Indian infantry brigades served with distinction in the Middle East, as did the Indian 3rd Motor Brigade. Initially intended as part of an Indian armored division, this former cavalry brigade was sent to the Western Desert in the spring of 1941, where it was overrun and destroyed by German tanks. Withdrawn and reformed, it returned to the desert just in time to be overrun and destroyed by the Italian 132nd “Ariete” Armored Division in the opening stages of the Gazala battles. A Sherman tank crew of the Scinde Horse Regiment, Iraq 1944. Its intended parent division, the Indian 31st Armoured Division, had been raised in July 1940 as the 1st Indian Armoured Division, but no staff was assigned to its headquarters until September. 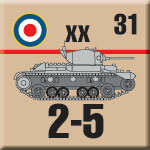 Initially it had two tank brigades, designated 1st and 2nd Armoured, and 3rd Motor Brigade. The 3rd “Meerut” Cavalry Brigade became the basis for the 2nd Armoured Brigade (originally just “The Armoured Brigade”) while 1st Armoured Brigade used the units of 1st Indian Motor Brigade, formed from former horsed cavalry units. As with Indian infantry brigades, the Indian tank units were mixed: two Indian tank “regiments” (battalions) and one British, later three Indian and one British battalions. The new division trained extensively but with very few tanks — the four tank battalions initially assigned to 1st Indian Armoured Brigade had three M3 Stuart tanks each, though a number of the obsolete India Pattern light tanks were used for crew training. In contrast to practice in British brigades, each armored brigade also included a battalion of motorized infantry. Though lacking tanks, 2nd Armoured Brigade was detached and sent to Iraq in January 1942 and re-designated 252nd Armoured Brigade. Division headquarters moved to Iraq in June 1942, where it took command of the shattered remnants of 3rd Indian Motor Brigade and the 252nd Indian Armoured Brigade, which still had no tanks. 1st Armoured Brigade remained in India. Armor finally arrived in November, when one battalion received M3 Stuart light tanks and the other two received M3 Grant medium tanks. Two of its battalions were Indian (the Stuart-equipped 4th Duke of Cambridge’s Own Lancers, known as Hodson’s Horse and Grant-equipped 14th Prince of Wales’ Own Cavalry, the Scinde Horse) and the third British (the 14/20th Hussars, equipped with Grants). Soon afterward, 3rd Motor Brigade received three new Gurkha battalions in place of its old dismounted cavalry units, and was re-designated 43rd Gurkha Lorried Infantry Brigade. 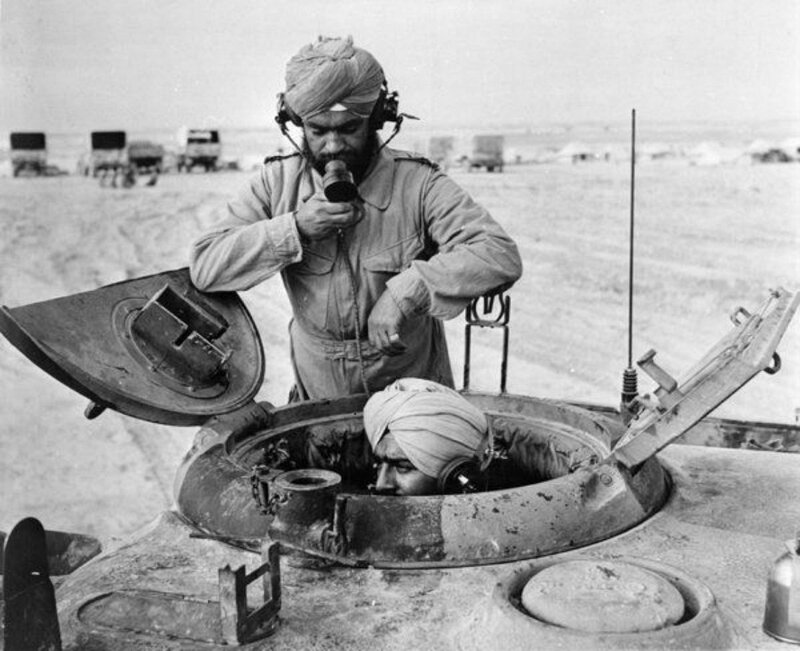 Sikh tankers of the 31st Armoured Division, Iraq 1944. The British command appears reluctant to allow colonials of any color to function as a modern, independent formation — the Australian 1 Armoured Division was also kept on a short allotment of tanks and London frowned on New Zealand’s efforts to create a tank brigade and South Africa’s raising of an armored division. India’s tankers spent the war at home or on garrison duty, with only a few small units seeing action in Burma. Yet despite the pushback from London, the British Indian Army drafted ambitious plans for more armored divisions, forming 32nd Armoured Division in April 1941, 43rd Armoured Division (later renumbered 44th) in July 1942. By early 1943 the 32nd Armoured Division had been disbanded, while 43rd Armoured initially administered Indian Army tank units operating independently and became 21st Indian Infantry Division in 1944. Thirty-First Armoured never saw action as a unit, its closest brush with combat coming in April 1944 when it was rushed to Egypt to crush a mutiny among the Greek 1st Infantry Brigade. The Indian tankers received Shermans in November 1943, apparently in preparation for transfer to combat in Italy, but only drove them in Iraq, Syria and Egypt. Their older tanks appear to have been shipped back to India to equip the still-tankless 251st Armoured Brigade (the original 1st Armoured Brigade). The Gurkha brigade was detached in October 1944 and went to Italy, where it saw action as an independent unit. 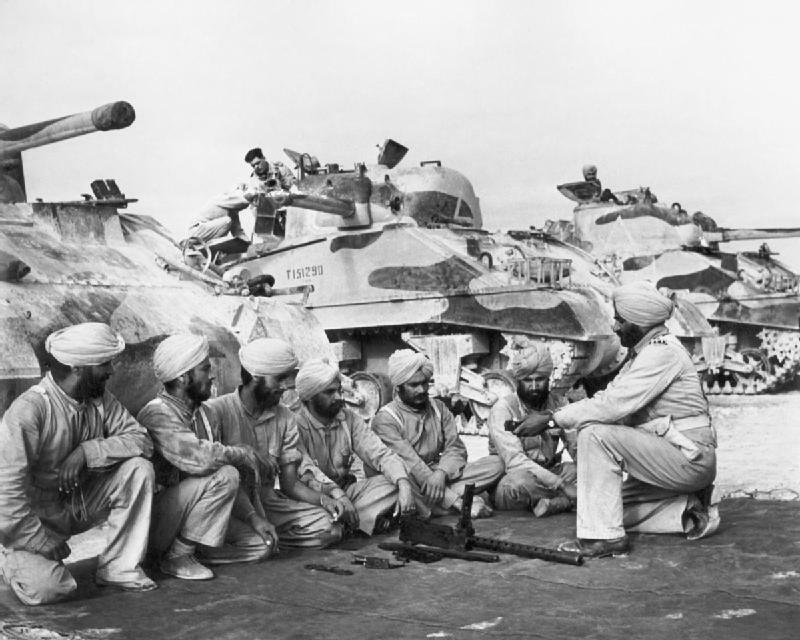 Returning to India at war’s end, 31st Armoured Division was redesignated 1st Armoured in September 1945 and was allotted to India during the partition of the British Indian Army two years later. Soon afterward, it conducted Operation Polo, the Indian Army’s first military campaign, crushing the small army of the princely state of Hyderabad which had resisted incorporation into India. The division saw action in wars against Pakistan in 1948, 1965 and 1971 – still operating Shermans in all three conflicts – and is again known as 31st Armoured Division. We included a playing piece for the Indian 31st Armoured Division in Co-Prosperity Sphere so you can add the division to Great Pacific War as well as use it in the Co-Prosperity Sphere scenarios. We had to cut this section from the book for reasons of space – we had way more good stuff than we could cram between its covers. It’s just one fairly weak piece, representing a division usually accounted for amid the British capability to field armored units, but it’s a fun little addition since Indian units appear in play a little differently from standard British ones. The 31st Armoured Division is an Indian unit, and should be a 1941 Force Pool addition in the 1939 campaign, and appear in the British Force in all other Great Pacific War scenarios. 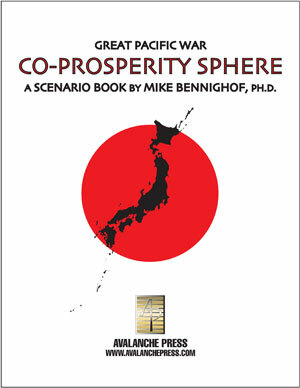 It’s already included in Co-Prosperity Sphere scenarios, but note that it is subject to the same rules as other Indian units even though it lacks the “IN” indicator. Note that it’s a division, subject to all the special rules for divisions.